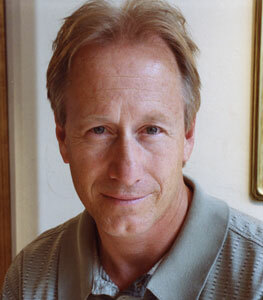 "Santa Fe is and always will be a center for art and art collectors." 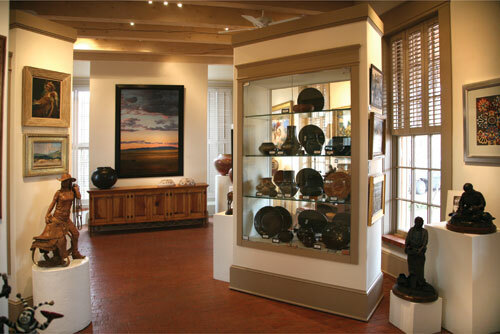 Mark Sublette Medicine Man Gallery Santa Fe specializes in the lifework of Maynard Dixon, San Ildefonso potter Maria Martinez, and works by the Taos Society of Artists. The gallery always has an exceptional array of Native American antiques, contemporary paintings and sculpture by nationally acclaimed artists, including members of the Cowboy Artists of America. 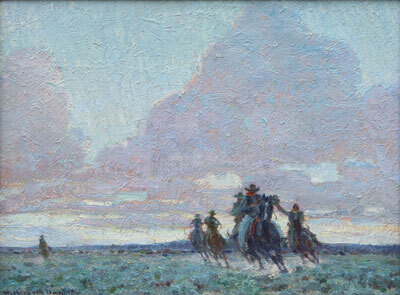 W. Herbert Dunton (1878-1936) The End of the Day, c. 1915, oil on canvas, 12" x 16"
“Santa Fe is and always will be a center for art and art collectors. I would expect the serious art lovers will still show up in force while the general tourist market will be off. In fact, this may be the best summer ever to visit Santa Fe as parking, restaurants, and hotels will be less crowded and much cheaper,” says gallery owner Dr. Mark Sublette. Upcoming shows at the Santa Fe gallery include Navajo Saddle Blankets (c.1870-1930) July 15th to September 15th which includes a superb collection of saddle blankets from owner Dr. Sublette, the Maria Martinez and Family 11th annual Show and Sale opening Friday, August 14th, and new works by exceptional artists Shonto Begay. There is also the lively and popular Indian Market Weekend Gallery Show and Sale, which will be held Friday, August 21st, 2 to 4 p.m.
“The great stuff, those hard-to-find pieces by top contemporary and deceased artists, is still very much in demand,” says Sublette. Sublette also says two hot artists that always seem to sell out in the summer, Francis Livingston and Dennis Ziemienski, will have new works available. “They are going to focus on little gems, those great small paintings that will sell even in a recession,” says Sublette. Native American antiques, contemporary paintings and sculpture by nationally acclaimed artists are found in every corner of Medicine Man Gallery Santa Fe. The gallery has a second location in Tucson, Arizona.